Objective: Study the anticonvulsant activity of ethanol extract Pandanus odoratissimus Linn in Swiss albino mice. Research Design and Methods: P. odoratissimus Linn (Pandanaceae) was evaluated for anticonvulsant activity in rodents. Animal models used include maximal electroshock test (MES); picrotoxin induced convulsions (PIC) and strychnine induced convulsion - (SIC). Results: Increase in latency to seizures as well as a reduction in duration and frequency of seizures indicated anticonvulsant activity. The selected extract was more effective in all models used except the SIC. P. odoratissimus ethanol extract (100 and 200 mg/kg body weight) significantly (P < 0.05-0.01) shortened the duration of convulsions in MES and PIC-induced seizures. Delay in the onset of convulsions in the two tests was significant (P < 0.01). Reduction in the frequency of seizures was also significant (P < 0.05, 0.01) in both tests. P. odoratissimus further delayed the onset of seizures in PIC induced seizures model while producing (66.7% and 83.33%) protection against death in mice. Diazepam (5 mg/kg) and marketed drug sample of P. odoratissimus (0.5 mg/kg) were used as reference anticonvulsant drugs for various models. Diazepam blocked the effect of the extract in the PIC and SIC tests significantly suggesting that P. odoratissimus may be acting by enhancing the effects of the gamma amino butyric acid ergic system. Conclusions: The ethanol extracts of P. odoratissimus Linn possess anticonvulsant activity since it delays the duration and the latency of seizures produced by MES and PIC. Rationale: The present study deals with the evaluation of antistress activity in acetone extracts of M.paradisiaca unripe fruit peels and acetone extracts of M.paradisiaca ripe fruit peels (AURMP, ARMP) with special reference to stress induced depression in animal models. The presence of high amounts of plant sterols and triterpenoids in the peels are expected to reduce the cholesterol level and the modulating effect of cholesterol in the stress and chronic depression. The potentially high antioxidant activity in peel extracts is hypothesized to produce the adaptogenic activity. Materials and Methods: The anoxia stress was evaluated on the 7 th , 14 th , and 21 st day, one hour after the AURMP and ARMP treatment in the anoxia stress model. The swimming endurance stress was assessed as the mean swimming time on 8 th day following AURMP and ARMP treatment. The antidepressant activity was measured using open field and forced swim test (FST) following chronic variable stress (CVS) model. 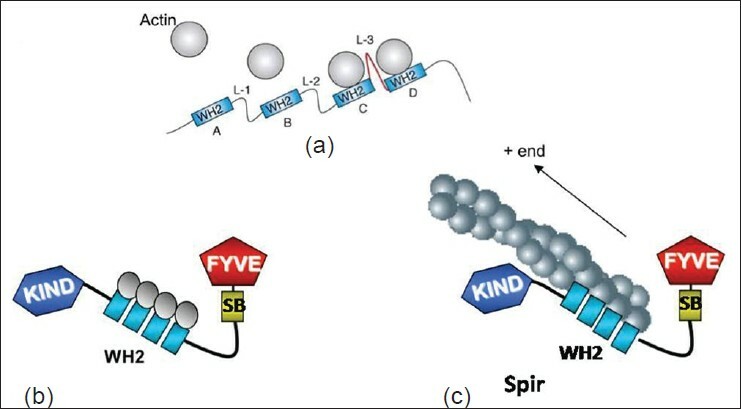 The level of tryptophan in brain was estimated ex vivo by HPLC technique. 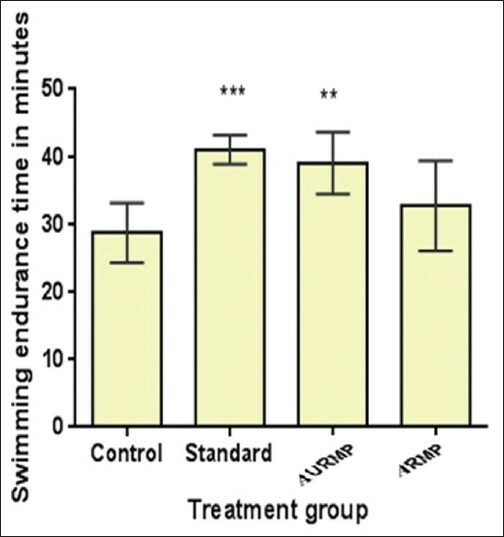 Results: The mean endurance time was increased significantly by AURMP (39.17 ± 1.88) treatment (P < 0.01) alone in comparison with the control in swimming endurance test. The anoxia stress model also showed significant (P < 0.001) antidepressant activity for AURMP and ARMP. Both AURMP and ARMP had suppressed the stress induced by CVS model and this was evidenced from the results of FST and open-field test confirming antidepressant activity. It is concluded that the AURMP and ARMP had shown promising antistress activity. Background: Calendula officinalis Linn. (Asteraceae) is an aromatic herb growing in the forests of India, China, Central Europe, and some tropical areas. The study was designed to investigate the scientific basis for the traditional claim of C. Officinalis on asthma. In the present study, methanol extract of whole plants was evaluated for preliminary phytochemical screening and antiasthmatic activity on different animals. Subjects and Methods: The asthmatic activity was evaluated by histamine- or acetylcholine-induced bronchospasm in guinea pigs, compound 48/80-induced mast cell degranulation in wistar rats, histamine-induced constriction on isolated guinea pig trachea, and ovalbumin-induced sensitization in mice at different dose levels of C. Officinalis. The preconvulsion dyspnoea time at 0 th and 7 th days at the dose of 250 and 500 mg/kg in guinea pig, the percentage of granulated and degranulated mast cell of at the dose of 600, 800, 1000 μg/mL in rats, muscular contraction at the dose of 600, 800, and 1000 μg/mL on isolated guinea pig trachea and the inflammatory cell count, that is, eosinophils, neutrophills, lymphocytes, macrophages, interleukin (IL)-4, IL-5, and immunoglobulin-E (IgE) from bronchoalveolar lavage fluid at the dose levels of 50, 100, and 250 mg/kg in mice were evaluated and compared with respective control groups. Results: Phytochemical studies revealed the presence of flavonoids, steroids, saponin, terpenoids, lignins, and phenolic compounds in the extract. 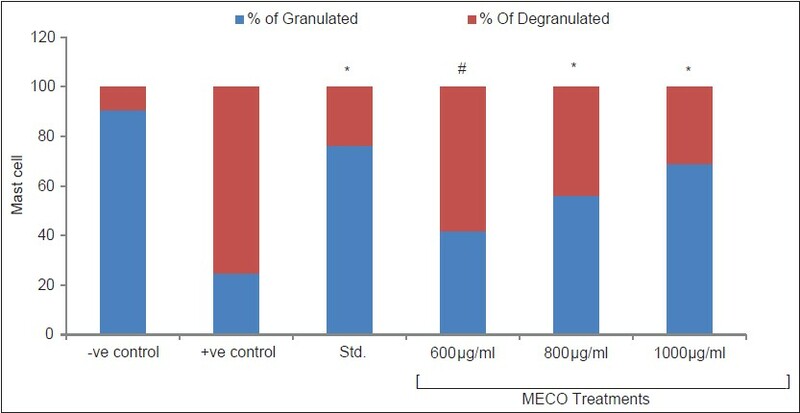 In addition, the treatment of methanolic extract of C. officinalis (MECO) significantly (P < 0.001) decreased the bronchospasm induced by histamine or acetylcholine in guinea pigs, degranulation mast cell in rats, histamine-induced constriction on isolated guinea pig trachea, and the level of inflammatory cells as compared with inducer groups. The antiasthmatic activity was potentiated in all the doses in dose-dependent manner. Conclusion: The present study concludes that the antiasthmatic activity may be due to the presence of above phytoconstituents by antihistaminic, anticholinergic, antispasmodic, and mast cell stabilizing property. Background: Cypermethrin is a synthetic pyrethroid commonly used in agriculture, veterinary, and household insects/pests management. Resveratrol a polyphenolic phytoalexin abundantly found in grapes and red wine is a potent antioxidant and cytoprotective agent. Objectives: Neurotoxicity of cypermethrin is well-known. The aim of this study was to evaluate neurotoxic effects of cypermethrin and protective role of resveratrol in Wistar rats. Materials and Methods: Thirty male Wistar rats were divided into five groups. Group A served as control. Rats of Group B were treated with cypermethrin at the dose of 3.83 mg/kg body weight (bw) for 7 days. Group C and D were post- and pretreatment of resveratrol (20 mg/kg bw) along with cypermethrin exposure. 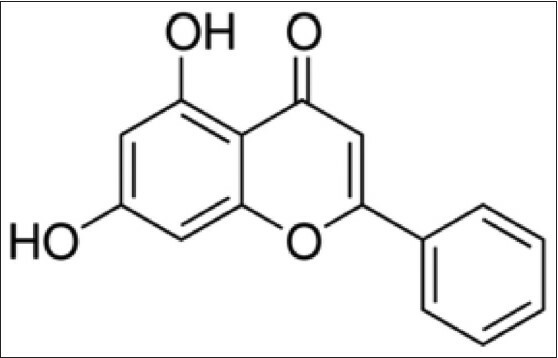 In Group E, resveratrol served as control. Results: Cypermethrin treated group showed elevation in lipid peroxidation (LPO 83.99%) and inhibition in glutathione (GSH 12.81%), superoxide dismutase (SOD 17.08%), catalase (CAT 11.51%), glutathione-S-transferase (GST 12.12%), glutathione reductase (GR 77.55%), glutathione peroxidase (GPX 23.78 %), total protein (42.95%), and acetylcholinesterase (AChE) activity (47.64%) in rat brain. Posttreatment, pretreatment, and treatment with resveratrol reversed the toxic effect induced by cypermethrin. Conclusion: Our findings strongly suggest that cypermethrin-induced neurotoxicity may be mediated through free radical formation, reduced antioxidant defense mechanism, and inhibition of acetylcholinestrase (AChE) activity. 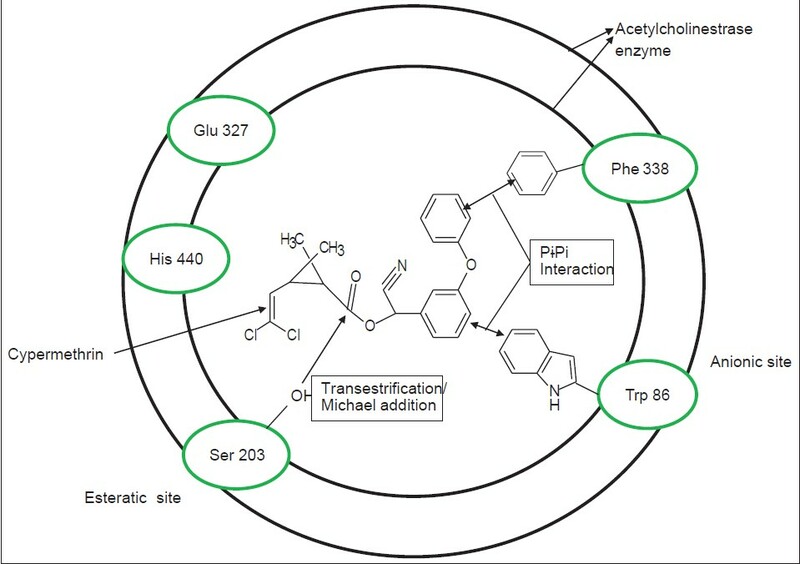 Cypermethrin may be showing AChE inhibitory activity by interacting with the anionic substrate binding site. Administration of resveratrol increased AChE activity and ameliorated cypermethrin-induced brain damage in Wistar rats. 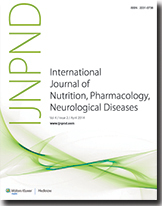 Objectives: To evaluate the effect of chrysin, a natural biologically active compound extracted from many plants, mushrooms, honey, and propolis on the tissue and circulatory antioxidant status and lipid peroxidation in Nω-nitro-L-ariginine methyl ester (L-NAME)-induced hypertensive rats. Materials and Methods: Hypertension was induced in adult male albino rats of the Wistar strain, weighing 180-220 g, by oral administration of l-NAME (40 mg/kg BWT/day) in drinking water for 4 weeks. Rats were treated with chrysin (25 mg/kg BWT/day) for 4 weeks. 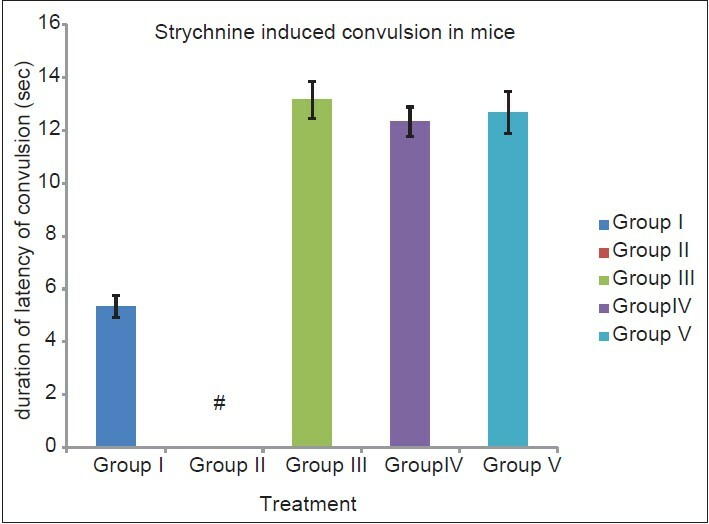 Results: The results showed significantly elevated levels of tissue malondialdehyde, protein carbonyl, and xanthine oxidase, and significantly lowered nonenzymatic antioxidant activity of glutathione reductase and glutathione-S-transferase in l-NAME-induced hypertensive rats compared with those in the control group. Supplementation of chrysin at the dosage of 25 mg/kg considerably decreased the levels of malondialdehyde, protein carbonyl, and xanthine oxidase and significantly increased the activities of glutathione reductase and glutathione-S-transferase in the tissues and blood compared with those in the unsupplemented l-NAME-induced hypertensive groups. Conclusions: Chrysin offers protection against free radical-mediated oxidative stress in rats with l-NAME-induced hypertension. The aim of this study was to investigate the potential antidepressive effect of aqueous extract of Phaseolus vulgaris (AEPV) and its mechanism of the antidepressant-like action in validated models of depression. Force swim test (FST) in rats and 5-hydroxytryptophan (5-HTP)-induced head-twitch responses (HTRs) in mice were performed to assess the potential antidepressant-like activity of AEPV. 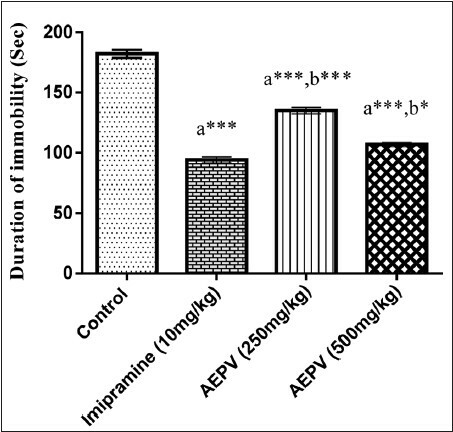 Oral administration of AEPV markedly reduced the duration of immobility during the FST in dose-dependent (250 and 500 mg/kg) manner and these effects were similar to that of imipramine. However, AEPV at a dose of 500 mg/kg, p.o. potentiate 5-HTP-induced HTR in mice, as similar to that of fluoxetine (FLU). In conclusion, this study depicts the antidepressant-like effect of AEPV in animal models of depression. Context: Nonsteroidal antiinflammatory drugs (NSAIDS) are mainstay of therapy in various inflammatory conditions. Its long-term use is associated with acid peptic diseases requiring prophylaxis with antiulcer drugs. Thus the question arises whether inhibition of gastric acid secretion affects the bioavailability of NSAIDS. Thus prescribing NSAIDS together with H 2 blockers seems to be a safe strategy but the combination becomes less effective for its primary intention. Aims: To evaluate the effect of combination therapy on efficacy of NSAIDs in terms of analgesic, antiinflammatory and antipyretic activity. Settings and Design: Experimental study in albino rats. 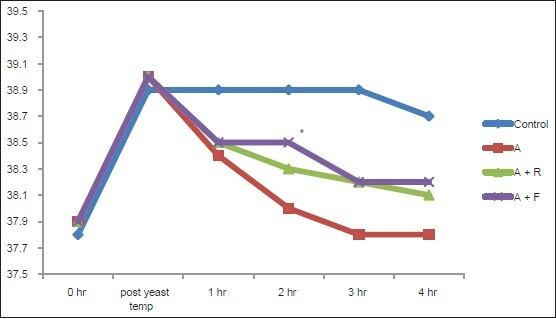 Materials and Methods: Evaluation of analgesic activity was done by acetic acid writhing model, antiinflammatory activity was assessed using carrageenin-induced paw edema and for antipyretic activity yeast was used (n = 6). Gastric juice pH was analyzed. Statistical Analysis: Comparison between different groups was done by one-way analysis of variance (ANOVA) followed by Tukey's test using Graph pad prism software version 5.01. The analgesic, antiinflammatory, and antipyretic activity was significantly reduced when aspirin, diclofenac and piroxicam were combined with famotidine. There was a pH rise in H 2 blockers pretreated groups, which was more with famotidine as compared with ranitidine pretreated group. Conclusions: Prescribing NSAIDs and H 2 blockers together seems to be safe strategy but the drug combination becomes less effective for its primary intention of reducing pain, fever, and inflammation.